The weather was variable during this time period having many some beautiful days in the low to mid 70’s but we did have two distinct cold fronts with rain and the second front brought day time highs down to 48 F and a low of 30 F. This seemed to turn on the toothy critters and some big trophies were caught along with many Trophy Smallmouth Bass. Long time return guests Steve & Debra Johnson from Halltown, MO. were back to chase the BIG Smallmouth Bass that roam our waters. 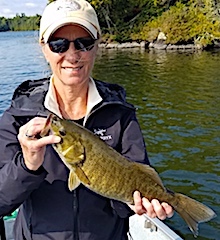 1st day was a weather-in day for Debra as it was windy, cool, & rainy so Steve faired it alone catching 9 Smallmouth Bass including a 19.5-inch and 18-inch trophy and 6 Northern Pike. 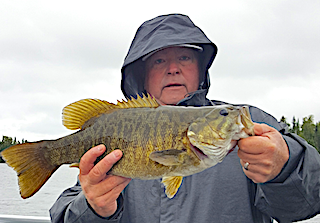 2nd day despite cold front conditions they managed to catch 24 Smallmouth bass with most on the bigger side up to 17.5 to 18-inches. 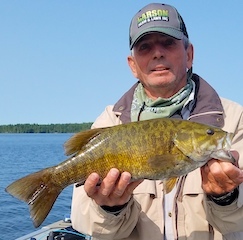 3rd day Steve said they caught a bunch of Smallmouth Bass with a lot over 15-inches up to 18.5-inches. 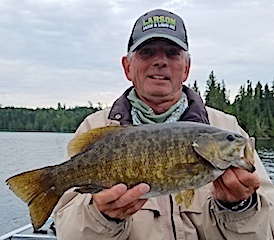 4th day was more of the same with a mix of sizes toping out with Steve landing a 19-inch monster Trophy Smallmouth Bass. 5th day was slower then previous days, and we blamed it on the light SE winds, but they still caught 9 Smallmouth Bass. 6th day the light SE winds persisted but managed to catch a few more fish. 7th day was as calculated when talking at breakfast Steve mentioned the wind had changed to the SW and we figured the Smallmouth Bass would be good in the afternoon. Well they caught only 2 Smallmouth up to 1:00 PM and ended up with 25 by 4:00 PM with some nice fish 16 to 17.5-inches. 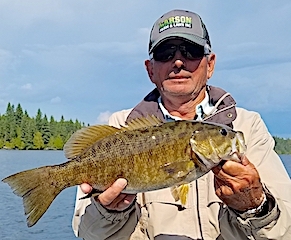 8th and 9th days they caught about a dozen Smallmouth each day with most in the 15 to 17 inch range plus some Northern Pike. 10th day Steve lost a huge Smallmouth first thing, and then caught 9 others and several Pike. 11th day they did very well catching 19 BIG Smallmouth Bass with 4 over 18-inches up to 20-inches. 12th and 13th days were not about numbers but excellent quality catching most of their fish 17, 17.5, and an 18-incher weighing 4 pounds. That is a HUGE 18-inch Smallie. 14th and final day they were faced with windy cold front conditions, temps not expected to get out of the high 50’s. 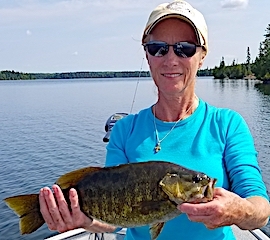 Debra opted out and Steve fished just a partial day alone ending his fishing with two BIG Smallmouth Bass measuring 19.5 and 18.5-inches. Both had a fabulous stay visiting with the other guests and enjoying the wilderness surroundings at Fireside Lodge. Guest of 20 years, Paul Letourneau from North Oaks, MN returned for his 2nd trip in 2017 with Spencer Olson from Minneapolis, MN for their traditional August fishing trip. 1st day they caught both Northern Pike and Smallmouth Bass. 2nd day they caught some Smallmouth Bass and a lot of Northern Pike casting a trolling. 3rd day was a good day for Northern Pike but the big fish they were looking for just did not show up. 4th day was a great day catching over 33 Northern Pike and two nice walleye. 5th day these two caught some nice Northern Pike to 31-inches and got chased in by thunderstorms. 6th and final day they were really trying for a trophy fish catching well over 20 Northern Pike but the large trophy fish evaded them this trip. 2nd year return guests Wade Keiss, David Goacher, and Kurt Koziol respectively from Mount Prospect, Libertyville, and Prospect Heights, IL were glad to be back chasing Northern Pike. DOA in just a few hours of fishing they got a good start catching 12 fish. 1st full day was very good catching 24 Northern Pike up to 30-inches and 2 Smallmouth Bass. Day 2 was spent exploring a new arm of the lake they have never fished before and the results were not as good as day one, landing 8 Pike, but that’s fishing. 3rd day the caught 18 Northern Pike and Dave caught a Trophy Smallmouth Bass measuring 18-inches. 4th and final day they finished strong catching 29 bigger Northern Pike Wade catching the largest measuring 37-inches. All had a great time and hope to return next year. Return guests Donn, Matthew, and Christopher Seidholz from Omaha, NE were glad to be back. 1st day was great catching many nice fat Northern Pike using the magic Yo-Zuri suspending twitch bait. They have the pause technique down to a science getting most fish to hit on or just after the pause. 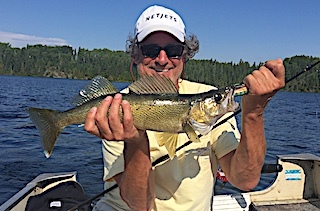 2nd day was a great day catching many numbers of Northern Pike and a nice walleye. The also enjoyed a fabulous shore lunch taking about 2.5 hours enjoying the whole experience cooking over an open fire on a beautiful day. 3rd and final day they had a blast fishing and just making great conversation. Fishing is one of the best ways to reunite and being that these three are traveling their opportunity to see each other is slim. 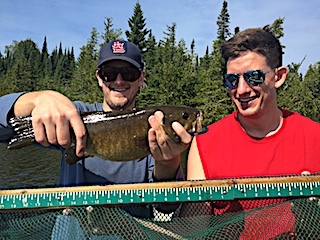 All left having a wonderful stay, making some special father & son memoires and thanks for choosing Fireside Lodge for your family fishing destination. Returning to Fireside Lodge for their 4th consecutive year were Reed Thacker and Todd Cambron from Indianola, IA. 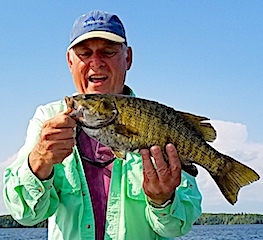 DOA the caught 15+ Smallmouth Bass several Northern Pike and had several large follows, 1st day They caught a good quantity of both Northern Pike and Smallmouth Bass plus they saw a few of the big fish they are after. 2nd day they caught 18 total fish and it was again a mix of Smallmouth and Northern Pike with that trophy still evading them. After some discussion and tackle purchases from our tackle shop they were off for their 3rd and last day of fishing. Well they had a good day catching both Smallmouth Bass and Northern Pike on the new lures they purchased and Reed was especially impressed with the Yo-Zuri he bought as it not only caught a bunch of Pike but he had two large Muskie follows on this lure. Both left as fast as they came saying they had an absolutely fabulous stay and intend on returning again in 2018. Bob Babcock and Jane Waldron from Midland, MI returned for their 19th consecutive year to chase BIG toothy critters. DOA when Bob was catching a small pike and HUGE Muskie came up and took a swipe at it hung around a little the disappeared. Bob said it was very large at least 45 to 48-inches. 1st day Bob had a good day catching all the fish and Jane did and excellent job making sure Bob’s fish got into the net. 2nd day it was almost the reverse with Jane having the hot hand catching most of the fish. 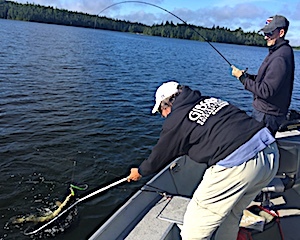 3rd day things equaled out with both Jane & Bob catching a bunch of sizable Northern Pike. The only difference was that in picture taking end of things Bob focused a little too much on the fish and not enough on Jane (see photo). The only hope of seeing Jane’s head was Photoshop. 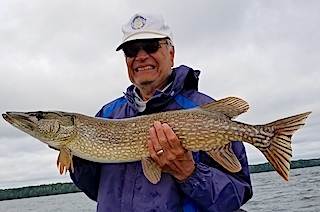 4th day was very rainy but very active catching many Northern Pike the Biggest going to Bob at 38-inches and Jane’s largest was 35-inches with many 30+. 5th and final day they had a very good day catching lots of Northern Pike finishing their trip on a high note. Also, as usual they had great conversations with guests the already knew and met a few new Fireside Friends. Bryan Neel lll and Tim Stewart from Rochester, MN returned for their 2nd trip this year and for the 15th consecutive year to hunt BIG Northern Pike & Muskie. These two did very well on day 1 catching 21 Northern Pike and 10 Smallmouth Bass and Tim had a huge, approximate 45-inch Trophy Northern pike get off when it took off suddenly under the boat plus he landed an 18-inch Trophy Smallmouth Bass. 2nd day was fabulous catching many Northern Pike up to 1:30PM and Bryan had a terrific fight from a Muskie on his hands that he ended up landing measuring in at 45-inches. 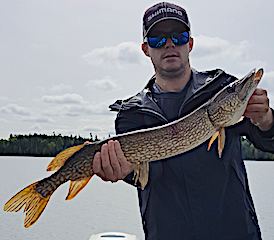 3rd day was a very rainy day with a cold front but the Northern Pike turned on catching 38 total, with ten being 33-inches or better, and Bryan landed a huge 40-inch Trophy. 4th day had them catching a few less fish than the day before all being good size and for the third day in a row Bryan caught a Trophy Fish this being a 42-inch very heavy Northern Pike. 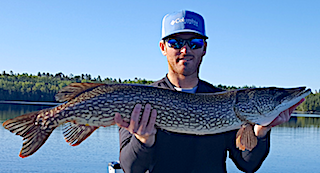 5th day had them catching 25 Northern Pike and a Tiger Muskie and for the fourth consecutive day Bryan caught a Trophy Toothy Critter this Northern Pike measuring is at 40.5-inches and Tim caught another Trophy Smallmouth Bass at 18-inches. 6th day was a little slower, still catching Pike, but they were not as aggressive as the previous days. 7th day they explored new areas catching about 20 Northern Pike. 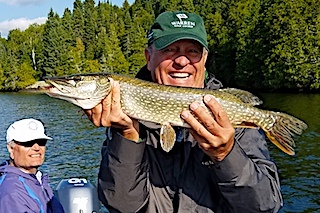 8th and final day was great catching 24 Northern Pike of all sizes, Tim caught a Trophy Smallmouth Bass at 18-icnhes plus a very large bodied 37-inch Tiger Muskie. Both had fabulous stay and enjoyed the last evening watching the beautiful sunset from their deck. Upon departure Tim said see ya in 6 months. Long time guest Gary Johnson from Midlothian, IL returned for his 3rd trip this year this time with sons Josh, and Charlie who joined them on Tuesday evening. First day out was a short but they caught some nice Northern Pike and Gary caught a HUGE Trophy Smallmouth Bass on a classic lure, The Road Runner. 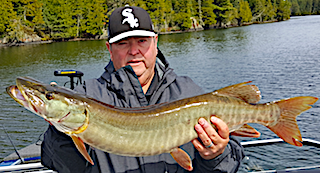 The 2nd day, had Charlie joining them catching Northern Pike and Gary caught a very nice heavy Muskie measuring 38.5-inches. 3rd day was a post cold front day catching-11 Northern Pike. 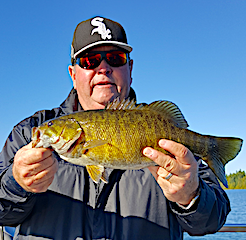 4th and final day was terrific catching 30 fish, 6 Smallmouth Bass all Big, and two were Trophy Size caught by Gary. The remaining fish were nice size Northern Pike and with Josh landing a large 41-inch Trophy Northern Pike. All left making some wonderful father and son memories and intend on returning in 2018. 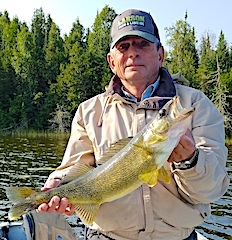 Special Note: This is our final fishing report for 2017 so Audrey and I would like to thank all of our guests from this year and the last 28-years for making the success we have had a Fireside Lodge possible. It is all of you that bring energy to Fireside Lodge and make it come alive. Also all the friendships we have developed with our guests is way beyond our expectations, and we thank you all for making that possible. As I write this we are hard at work already preparing for the opening of or 29th fishing season in 2018 which is looking to be very active. We have been receiving an unusual number of early reservations and for those of you planning to visit us in 2018 you may want to start early so your preferred dates are available. 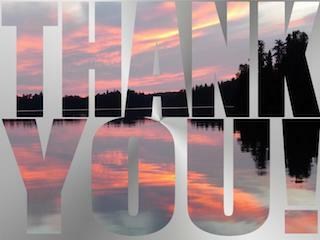 With that we wish you all a wonderful fall and winter, Thanks Audrey and Alan. Next Fishing Report will be May of 2018.